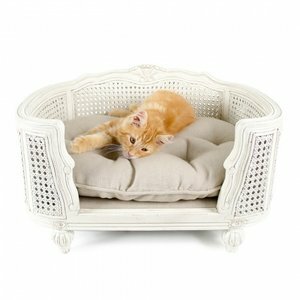 A beautiful and stylish handmade cat bed in Louis XV style with a ecru cushion. Available in different sizes. This beautiful cat sofa has a royal look. This is no coincidence, because the design is based on the style of the French King Louis XV (1710-1774), a late Baroque style. The cat bed is beautifully handmade with a striking round frame of solid oak.